← Is it time for the papal tiara? Why was US go-ahead goal disallowed? Fans and players of the national team are livid tonight after it had a World Cup win turned into a draw because of a questionable call by Malian referee Koman Coulibaly in the 86th minute, wiping out what appeared to be a perfectly good and pivotal goal by Maurice Edu against Slovenia. The ref’s decision also cost the United States a slice of soccer history; in 80 years, no team had ever rallied from a two-goal deficit to win a World Cup game. According to Landon Donovan, the referee even refused to explain what the foul was assessed [!?!] for after the game (referees are not required to explain their decisions to reporters or players at the World Cup). FIFA has not explained the bad call. I don’t think they can explain the bad call, other than bad officiating. In the meantime, my condolences to HF about Germany. This entry was posted in SESSIUNCULA and tagged bad call, FIFA, world cup. Bookmark the permalink. It was not called an offsides. I have yet to hear that offsides was the ruling. What was floating around was a foul was the reason for disallowing the goal. Brian, no, it is when the ball is struck/passed at that point in time that there must be two defenders even or in front. When the ball is stuck you can then run to meet the ball. So watch it again with that in mind. This board needs an edit feature!! That said, if you freeze frame this vid at about 18 sec., you see that there is not an obvious offside, though there are two players entwined in a hug/dance that are about even, which is not offside, though it would be very hard to call that. So it is not a ‘very bad call’ just a close one that was probably not offside. The rules of the offside are this: the player who gets the ball must be behind the ball or at least two defenders in the moment of the pass. Edu was behind three or four defenders when the pass was made. lpereira is right, people who do not touch the ball do not matter for offsides, and once the ball is struck, the offensive player could be 80 yards ahead of the defense for all it matters, he simply must be behind the second to last defender (usually the goalie plus one defender) when the ball is hit. Edu was onsides. Seemingly, the goal was disallowed for some other reason. This is bolstered by the fact that the ref blew the whistle, and not the assistant on the sideline, whose responsibility is to call offsides. As I have said elsewhere though, a) the reffing was bad through the whole game, going both for and against us, so to point to this is wrong, especially considering it was absolutely dreadful defense in the first half that saw us in a 2-0 deficit. Unlike the perfect game, there was more than just this one call in the game, so while the goal should have stood, its hard to pin the whole game on that. FIFA has often said that the human element of the officiating is part of the game. I get the there wasn’t an obvious call in the replays, but the ref certainly saw something – and that is a fact that has been undervalued or ignored in the reporting. He is a FIFA ref, and he didn’t reach that level by chance. And, the quoted reporter apparently didn’t talk to Maurice Edu (the scorer of the disallowed goal). Mr. Edu expressed disappointment, but he didn’t seem livid. I think he’s mature enough to realize that it’s part of the game. Finally, to summarize Alexi Lalas, the USA might have missed out on the win, but it is not as if they were robbed. Their general perfomance in the game wasn’t so spectacular or dominating to ensure a win or support such statements. I love the USA, and I want them to succeed and advance in the CUp, but this really is much ado about nothing. Not true..about only the player receiving the ball. one only has to be in an advantaged position..in the play or potentially so.. or interfering in some way, which would also apply… see above. Still, with the guys in a pack, it is hard to make that call, (except in hindsight and with slow motion with freeze frame and zoom and overhead angles. and ….) but that is sports. For those who don’t know soccer well, the two ref’s on the side lines are ‘linesmen’ and there job, as a linesman in tennis, is to focus on the lines, ball in or out, but their most important duty is the offside call so they constantly position themselves to try to be even with the offside imaginary line. But with the guys packed in like that, it is so tough. I agree with you though, as my post above points out. and Patrick, your point is also right, but in some of the replays, you can see that the linesman never raises his flag, meaning he never signaled offsides. The head ref was the one who blew the whistle, and I don’t know that they would ever call offsides without the linesman flagging it, especially in a tight play like that. He simply must have seen some push or shove that he didn’t like and decided to blow the whistle. Harsh, probably too harsh, but that is the way the game goes. I used to be a referee in my seminary days in Ireland and refereed some inter-diocesan games here in the Philippines in the 1970s. Malian ref Koman Coulibaly was in an almost perfect position to make a judgment. There was a US player offside when the ball was kicked, though not Maurice Edu, as you can see clearly on the video at 0.20. The offside player could definitely be judged by the referee ‘as interfering with play, (or) interfering with an opponent, (or) gaining an advantage by being in that position’. Many offside calls are close and the rule causes more arguments than any other in the game. You win some and you lose some. I also heard it was not an “offside” call, and you are right about the linesmen, but another foul, probably grabbing. ‘Refs’ are not obliged to explain their calls at the World Cup. PS Though the assistant referees, formerly called ‘linesmen’, have a particular responsibility with regard to offside, the referee can make his own call or he may consult his assistant referee if he’s not sure. YAWN! Let me know when soccer is over and real football starts. Referees are part of the game. They make mistakes. It wasn’t an offside call, it was (theoretically) a foul earlier in the play that caused him to call the goal back. In all the replays I’ve watched I don’t see it. Nonetheless the call will – and should – stand. I’ve put four kids through club soccer; one played at the national level and played division one soccer in college. My youngest (11) plays now and I have a grandson (6) that plays. Soccer is life. Bad calls happen. In baseball we recently watched a perfect game. Perfect but for the last call in the game. Yeah, it was a bad call. Having umpired (and coached) Little League for a few years myself, I _know_ both sides of the story. But would you have it any other way? Really, would you have it any other way? …and another thing. I don’t how many were watching but you couldn’t be helped but be struck by the classy way the US argued the call. I’ve seen a lot of bad calls and a lot of worse reactions. I’m very, very proud of these guys. Even though these are supposedly the best (I’m amazed at the play I’ve seen), they are still Men, and not robots. Mistakes, even by a referee are part of the game. Without mistakes, it’s no longer human. The Offside rule dictates that the player who IS offside is deemed to be interfering with play. To quote the great Brian Clough “….if he (the player) is not interfering with play, what’s he doing on the pitch ?” It was marginal, the player has to be offisde when the ball is played forward, not before, not after. Having said all that I have watched it again and again and I actually believe The USA were EXTREMELY unlucky as the amount of holding and shirt pulling by their opponents should have led to at least one free kick (inside the box so a penalty, or the ref could have played the advantage = goal) and the same number of red cards. I wish the USA well and hope they qualify for the knock out stages. As for England, my local Team, Stevenage (in England), just promoted to the Second Division from Non League, could have played better than that. Edu kicked the ball off of his front foot. The ball was clearly in front of him for the kick. I believe in having video replays to help referees make or reverse decisions, and greater accountability from the referees and Fifa. Fifa’s current system is quick, but it allows glaring mistakes to spoil the game. Various baffling decisions can be made and everybody just has to accept them without question. How can that be a way to run a sport? Since Fifa’s integrity appears to be in question (http://www.transparencyinsport.org/The_10_Commandments_of_FIFA/the_10_commandments_of_fifa.html), I doubt that things will change soon. Anyway, all the best Team USA! anthtan: Calls for “instant replay” are only a rouse to get commercial breaks into the telecasts. moon1234: How can you enjoy a game with rules written into it to get commercial breaks into the telecasts? Have you ever seen an NFL game where the first half ended less than 30 minutes after the “two minute” warning was given? Calling offside on this one is questionable at best. But the fact that the ref missed no less than 3 offenses in the box that should have resulted in a penalty shot is really pathetic. The ref also called a hand ball against one of our guys early on…for a ball that hit him in the face. I also read somewhere that this ref has a history of bad calls. Supposedly, there’s a Facebook page called: TUNISA ALL AGAINST Koman Coulibaly the cheater. But there’s another angle to consider. We played a spectacular game…for 45 minutes. Unfortunately, a match lasts 90 minutes. The bad call would not have mattered if we’d played a better first half. Though I think the last goal should have counted, and we should have been awarded a penalty kick for all the holding in the box, I think the result is exactly what we deserved for playing a rather limp half a game. I played through my freshman year of college, and I disagree strongly with those calling for instant replay in soccer. If ever there’s a sport that should NOT be subjected to instant replay, this is it. It’s a continuous flow game, and instant replay would break that. When you play the game, you learn to live with the officiating. For the most part, I think soccer refs do a pretty darn good job. FIFA actually does a good job for the most part. My guess is that Coulibaly may well have reffed his last international. You never know, but I wouldn’t be surprised. I would proffer that the fact that US Soccer feels somehow “robbed” (as I said it is not such a cut and dried “awful” call, especially considering speed angles, etc. I freeze frame’d this multiple times and it was not an easy call, especially since it was perhaps not “offside” that was the call at all -the ref never made it clear, one way or another, to my knowlege – but I digress) is not quite the huge FIFA “incident” that would trigger calls for his head, just some here, really,and in fact, many countries, especially England, Slovenia and Algeria are probably very happy about the call!! He might get promoted to ref the final now! Do you think it’s possible that there’s some sort of anti-US bias among international soccer refs? We also got robbed in the ’02 World Cup in our match against Germany, from what I understand…this ref also gave an egregious yellow card on a “handball” to a player who hit the ball squarely with his face. I’m somewhat a novice to the sport, so I don’t know if I’m just engaging in wild conspiracy theories. One of the points the commentators kept making was that there was fouling going on all over the place (happens all the time with corner kicks), so calling this one out seemed biased against the US. I’m actually more upset about England’s abysmal performance yesterday against Algeria. I mean, really, 0-0 against Algeria? They’ve really got to pull it together in the match against Slovenia if they want to advance. They looked like school boys out there! Mike, whether any one at all was called for offside is not clear, the ref simply called a foul which my be construed to be offside or something else, he doesn’t have to say. Also, no one would argue about Edu being offside, that is clearly not the case, but the culprit would be the blond player. Again, it was not certain whether offside was even called. Then he asked me where the officials were from. “Bali,” I said. The priest’s shocked reply, “Referees do not come from Bali!” Not any more they don’t, I said. Holy cats that is just freaking hillarious. I really did LOL when I read it. I watched the film about Clough, “The Damned United” last spring and utterly loved it. Looks to me that the one that is offside is #4 Bradley, and very clearly so. For offside rule purposes the relevant moment is when the pass is made not when the ball is received. If there is a player all alone in front of the keeper (i.e. no other players from the opposite team between him and the keeper) when the ball is passed, that is an offside. Bradley’s is in an offside position that can become an offside offense if he is interfering with the play, which he is insofar as the goalkeeper has to keep an eye on him due to his menacing position. How can Bradley be offside when he has an opposing player trying very hard to occupy the same physical space he is? The guy was hanging over his back. The fact that the lineman didn’t call it is far more convincing given that – especially for Bradley – the lineman was in the perfect position to see the play. The opposing player’s interference should have warranted a penalty kick given that it happened in the box. Besides, how often does FIFA expedite the review process and come in with a “poor” rating…within just a couple of days of the event. And you might also look at the “sending off” offenses according to FIFA rules. The player draped over Bradley could easily have been sent off. MWindsor- Exactly: “the guy was hanging over his back”, so Bradley was ahead. In fact, he was ahead of the whole defense, maybe by (literally) just a foot, but he was ahead when the ball was passed. That’s the problema. If Bradley had been an Italian player he would have acted a bit theatrically, let himself fall over and get a penalty kick. Which he deserved, because, very clearly, the defender committed a punisheable offense. But the referee did not see it which is the same as not happening (in football, that is). But, hey, that’s football. Any national team can tell you about a million cases like this one. In Spain, we all have vividly in our minds, the image of Luis Enrique, an striker, bleeding through his nose after receiving an elbow kick by an Italian player when trying to kick the ball into the net while in the box just a couple of minutes before time. The referee did not concede the clearest penalty in the history of the World Cup, which would have meant victory for Spain and progress into semis. Sorry. We’ll just have to agree to disagree. Law 11 says that they player is not offside if they are “level with the second-last opponent”. Your view is only possible if Bradley is facing the goal, but they have their sides to the goal and are therefore level. I remember the Enrique thing, though I could never have told you his name. In my part of the US, we have a saying at World Cup time: Anybody but Brazil! If Spain faces Brazil, then I’ll wear a red t-shirt that day. With our luck, we’ll draw Germany in the first game of the Round of 16… Nothing about this is easy, is it? I heard another commentator remark that perhaps the ref felt he had made a mistake in awarding a free kick to USA. In order to correct the mistake he immediately made a call after the ball was played and awarded a free kick to Slovenia. 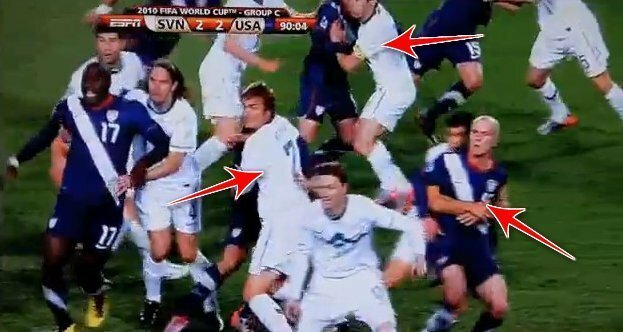 Now, I don’t have a replay of the incident that caused the USA free kick to be awarded, but this seems very plausible. It seems like a simple fix to the problem, far simpler than stopping the kick, trying to explain to the teams over the vuvuzelas that you made a mistake, and arranging for a kick in the other direction (if there was a foul by USA) or a drop-ball (if there was no foul and play was needlessly stopped). It is also somewhat embarassing to admit such a mistake was made, so not only would it save time, he would save face. Unfortunately, the ref underestimated the awesomeness of USA and did not blow his whistle fast enough or loud enough to stop Edu. To truly make much Edu about nothing…..
A new question I pose is this: If the above situation is true, and the ref did make a mistake in awarding the USA free kick, and tried to undo his mistake by casually awarding a kick to Slovenia, did he commit a mortal sin? The referee certainly lied in awarding the kick to Slovenia. He had full consent of his will, and he had a full understanding of the lie he was committing. The only thing lacking is whether the situation is considered grave…. USA played well and deserved to win, but it’s nonsense to say that no team has ever recovered from a 2-0 loss to win a game. Off the top of my head I can think of Portugal v. North Korea in 1966. Portugal were down 3-0 and won the game 3-5 with Eusebio scoring 4 goals. ecclesiae: I wasn’t asking for instant replays (which the broadcasters already give us), but “video replays to help referees make or reverse decisions”. When you refer to a “rouse” (I presume you meant “ruse”) to insert more commercial breaks, I think you are talking about timeouts like in basketball, which are an opportunity to screen more commercials. No, I’m not asking for that.